This bulletin board serves to be an instructional as well as an interactive bulletin board for the students. 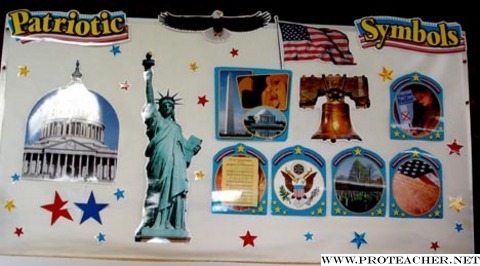 The bulletin board displays the various patriotic symbols of the United States including the Liberty Bell, the Bald Eagle, the US Flag, the Capitol Building, the Great Seal, the Statue of Liberty and the Constitution. Each week, a symbol is selected from the bulletin board and an activity is done with the kids regarding the symbol. For instance, one week the US Flag was chosen. The children were told the significance of the US Flag with its 13 stripes, 50 stars and the alternating red and white colors. Each of the students were also taught the pledge of allegiance. The bulletin board was made with the help of fifth grade students. The board is made out of cut-outs that were bought from an educational store.